This is the web site of author Steven Saylor. DVD Shop: FORTHCOMING MOVIES • WHERE ARE THE EURO MOVIES? ROME • EGYPT & BIBLICAL EPICS • HAIL SHAKESPEARE! THE LEGEND OF HERCULES Kellan Lutz gives a voluptuous performance in this movie which also stars a bunch of less beautiful people. HERCULES Dwayne Johnson stars as the demigod in a rip-roaring action film from director Brett Ratner. 300: RISE OF AN EMPIREThe surreal history of the war between Persia and Greece gets a new chapter in this sequel/prequel to the worldwide sensation 300. ATLANTIS Season One of the BBC series set in a mythical ancient world of gods, monsters, and magic. WRATH OF THE TITANS Sam Worthington returns as Perseus in this bravura sequel to Clash of the Titans. WRATH OF THE TITANS Not a movie, but a motion-comic DVD sequel to the original 1981 Clash of the Titans begins five years after Perseus slew Medusa. Includes bonus comic book. CLASH OF THE TITANS Sam Worthington stars as Perseus, son of Jupiter, destined to slay Medusa and challenge the Kraken. The story continues in the bravura sequel, Wrath of the Titans. CLASH OF THE TITANS The original 1981 version starring Harry Hamlin with special effects by the great Ray Harryhausen. Also on Blu-ray. Release the Kraken! SINBAD & THE MINOTAUR Manu Bennett (of Spartacus: Blood & Sand fame) stars as the legendary hero in a setting of ancient Greek myth. IMMORTALS Henry Cavill plays Theseus in an eye-popping action fest from director Tarsem Singh, who last ventured to the Ancient World with the Alexander the Great episode in The Fall. HELLHOUNDS A Greek warrior must venture to Tartarus to rescue his murdered bride from the clutches of Hades. Originally shown on Syfy. LITTLE HERCULES The adventures of the child Hercules (Michael Dolen) in modern-day Burbank. Hulk Hogan (as Zeus), Elliott Gould (as Socrates), Robin Givens and Judd Nelson star. PERCY JACKSON & THE OLYMPIANS Think Harry Potter with Greek gods. Based on the popular fantasy novel by Rick Riordan. Sequel: Sea of Monsers. ULYSSES, based on The Odyssey of Homer, stars Kirk Douglas and Anthony Quinn. Made in 1956, four years before Douglas created a worldwide sensation as Spartacus. HERCULES: The Legendary Journeys • Season One The adventures of the mighty Hercules (Kevin Sorbo) as re-imagined by producer Sam Raimi, with guest appearances by Lucy Lawless as Xena. XENA: Warrior Princess • Season One All 24 episodes of the first season of this spin-off from Hercules, which made a star of Lucy Lawless (later seen in Spartacus: Blood & Sand). HERCULES ACTION PACK 4-disk sampler of the hit series starring Kevin Sorbo. Available separately: Xena Trilogy • Hercules & the Amazon Women/The Lost Kingdom • Hercules & Xena: Battle for Mount Olympus YOUNG HERCULES Ian Bohen plays the young demigod in this prequel to the popular TV series; Chris Conrad plays young Jason. WONDER WOMAN Witness the mythic birth of Wonder Woman as the Amazons battle the war god Ares from ancient Athens to Washington, DC. Two-disk Special Edition also available. THE FALL Visually stunning film by Tarsem Singh (The Cell and Immortals) includes fantastic tales about lengendary heroes, including Alexander the Great. YOU ARE THERE: ANCIENT GREECE Vintage TV: Walter Cronkite covers Alexander the Great and the death of Socrates as breaking stories. Robert Culp and E.G. Marshall star. GIANTS OF THESSALY Italian sword & sandal epic follows the Argonauts’ quest for the Golden Fleece, with Roland Carey as Jason and Massimo Girotti as Orpehus. ULYSSES 31: The Mysteries of Time Feature-length version of the French / Japanese animated TV series offering a futuristic, outer space retelling of the legend of Ulysses and the Olympian gods. HERMES: WINDS OF LOVE Japanese mysticism merges with Greek myth in a wildly visual anime version of Theseus and the Minotaur. AESOP BOPS! David Gonzalez and the Yak Yak Band retell timeless tales from The Complete Fables of Aesop, the great storyteller of Ancient Greece. AESOP’S FABLES: ANIMATED MORAL STORIES Wisdom for the very young drawn from the classic animal tales of Aesop. ONE TOUCH OF VENUS Like My Fair Lady, a variation on the myth of Pygmalion; love brings to life a statue of Venus (Ava Gardner). Based on the Broadway musical by Kurt Weill and Odgen Nash. 7 FACES OF DR. LAO Meet Medusa, Pan, and Apollonius of Tyana in this fantasy classic from George Pal, based on the novel by Charles G. Finney. ERCOLE SU’L TERMODONTE Vivaldi’s rediscovered opera was performed at Spoletto in 2006 with stiking sets and a daring performance by naked tenor Zachary Stains as Hercules among the Amazons. PROMETHEUS’ GARDEN Experimental short by underground animator Bruce Bickford, inspired by the Greek myth of Prometheus, the Titan who created the first mortals from clay and stole fire from the gods. THE 300 SPARTANS Classic movie about the battle of Thermopylae (subject of the bestseller Gates of Fire and the movie 300), starring Richard Egan as Leonidas. 300 Gerard Butler (Attila) stars. 2-disk edition loaded with extras, based on the graphic novel by Frank Miller. Also available: 300: The Art of the Film and the soundtrack cd. 305 “The Office” (they wish!) goes to Sparta. (If you thought 300 was already a joke, go to the head of the class.) MEET THE SPARTANS Not only a better movie than 300 (which it lampoons with surgical precision), but Sean Maguire (aka Kröd Mändoon) is almost as buff as Gerard Butler! YOUNG APHRODITES Sexual awakening in pastoral Greece, ca. 200 B.C. The screenplay by Vassilis Vassilikos (Z) was inspired by the Idylls of Theocritus and the ancient novel Daphnis and Chloe. JIM HENSEN’S THE STORYTELLER Anthony Minghella (The English Patient) created these darkly magical episodes based on European folk tales and Greek myths, narrated by Michael Gambon. COLOSSUS OF RHODES Intrigue, tyranny, and a devastating earthquake rattle Rhodes in 280 B.C. Rory Calhoun stars in Sergio Leone’s directorial debut. Dazzling widescreen print! CAMP CLASSICS 4 Warner collection includes Colossus of Rhodes, plus a very young Joan Collins in Land of the Pharaohs and the lavish Biblical epic The Prodigal. Cool extras! MEDEA Pier Paulo Pasolini’s 1969 version of the classic Greek tragedy by Euripides stars Maria Callas in her only film role. Also available on Blu-ray. (Paolini also made a film version of Sophocles’ Oedipus Rex.) PHAEDRA Jules Dassin’s update of the Greek tragedy stars Melina Mercouri, Raf Vallone and Tony Perkins, with spectacular settings in Greece, London and Paris. OEDIPUS REX Sophocles’ murder mystery psychodrama performed in masks, as the Greeks did it. Watch for young William Shatner in the prologue. OEDIPUS REX The oratorio by Stravinsky and Cocteau, brilliantly staged by Julie Taymor (director of Titus), with Bryn Terfel and Jessye Norman. Seiji Ozawa conducts. ANTIGONE Perhaps the greatest of all Greek tragedies receives a lavishly cinematic production. Was there ever a greater Antigone than Irene Papas? ANTIGONE Jean Anouilh, in Nazi-occupied France, wrote this timely, timeless version of the tragedy. Geneviève Bujold, Fritz Weaver, and Stacy Keach give brilliant performances in this 1974 production. IPHIGENIA Before they can sail for Troy, the Greeks must make a terrible sacrifice. Michael Cacoyannis directs from the the play by Euripides; Irene Papas stars. THE TROJAN WOMEN Michael Cacoyannis directs an amazing cast: Vanessa Redgrave as Andromache, Katherine Hepburn as Hecuba, Genevieve Bujold as Cassandra, Irene Papas as Helen. ELECTRA Murder begets murder in “the best film ever made from a Greek tragedy” (Roger Ebert). Directed by Michael Cacoyannis (Zorba the Greek), starring Irene Papas. It’s on Steven’s Top Ten List. ELECTRA, MY LOVE Greek tragedy, political fable, and spectacular rituals combine in a truly bizarre extravaganza from Hungarian director Miklós Jancsó. 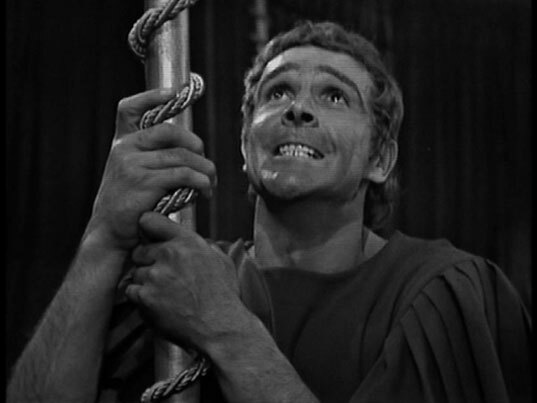 ALEXANDER THE GREAT (1956) Did the brash young Richard Burton make a more compelling Alexander than Colin Farrell? You decide! ALEXANDER THE GREAT TV pilot from 1964 (two years before Star Trek) stars William Shatner as the world conqueror, a pre-Batman Adam West, John Cassavetes, and Joseph Cotten. WAR GODDESS Racy tale of Theseus and the Amazons from James Bond director Terence Young; story by Robert Graves (I, Claudius). Plus War Gods of Babylon (widescreen) with Howard Duff. HERCULES Brawny Paul Telfer (of Spartacus) heads a strong cast in an engaging, thematically complex new version of the ancient myths, from the director of Augustus. HERCULES The original sword & sandal epic starring the great Steve Reeves, at last available in widescreen. Plus the very bizarre Mole Men Against the Son of Hercules with Mark Forest. HERCULES Classic Disney animation at its peak; glorious images of ancient Greece highlight a new take on the tale of the world’s most enduring hero. THE THREE STOOGES MEET HERCULES Greek myth gets a poke in the eye when the time-traveling trio match wits with King Odious of Ithaca and his brawny henchman, Hercules. Nyuk! Nyuk! HERCULES Animated, musical feature from Jetlag Productions; has English, French, and Spanish options. HERCULES The Timeless Tales animated version, produced in Australia; this 50-minute feature includes both English and Spanish language tracks. SINBAD: LEGEND OF THE SEVEN SEAS Greek myths and story elements abound in this spectacular Disney animated feature, starring Brad Pitt and Catherine Zeta-Jones. In Widescreen or Full Screen versions. MINOTAUR A young Tom Hardy stars as Theseus in this monster movie version of the myth of the hero in the Labyrinth. Also starring Rutger Hauer. STEVE REEVES COLLECTION Widescreen prints of two classics: Giant of Marathon, directed by Jacques Tourneur, and War of the Trojans, starring Reeves as Aeneas. TROY Brad Pitt stars as the brooding Achilles. In Full Screen or Widescreen versions. Also available: Director’s Cut Ultimate Collector’s Edition. HELEN OF TROY (1956) Inspired by The Iliad, Robert Wise directed one of the best and biggest movie spectacles of the 1950s. Read a great “making of” article here. HELEN OF TROY (2003) Revisionist miniseries stars Sienna Guillory as the willful, wayward Spartan queen whose face launched a thousand ships. JASON & THE ARGONAUTS (1963) The quest for the Golden Fleece, with Ray Harryhausen’s special effects and a thrilling score by Bernard Herrmann. JASON & THE ARGONAUTS (2000) Young Jason battles monsters, kings, and the gods themselves to win the Golden Fleece. Jolene Blalock plays Medea. Also available in a 2-disk set with Merlin. BEST OF BOYS IN LOVE includes the claymation short “Achilles” about the love of the Greek warrior and Patroclus (something you didn’t see in Troy! ), narrated by Derek Jacobi. SYLVIA Viewers rave about this brilliant production of Delibes’ ballet about Sylvia, a huntress for the goddess Diana, and her love for the shepherd Aminta. ALCESTE Gluck’s opera based on the tragedy by Euripides, featuring Greek-inspired designs by Robert Wilson. IL RITORNO D’ULISSE IN PATRIA Monteverdi’s opera staged by William Christie and Les Arts Florissants, with burly Kresimir Spicer as a heroic Ulysses. MEDEA Marina Goderdzishvili as Medea and Vladimir Julukhadze as Jason in the ballet of the Greek tragedy performed by the Tbilisi State Theatre. ORFEO ED EURIDICE Dame Janet Baker follows Elisabeth Speiser to Hades and back in Gluck’s opera, produced at Glyndebourne in 1982. 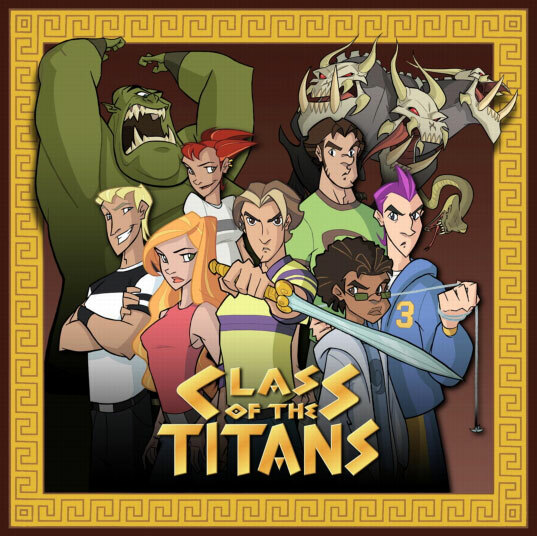 The Canadian animated series Class of the Titans debuted back in 2006, with tales of seven teenagers descended from ancient Greek heroes; they alone can thwart the nefarious schemes of the wicked god Cronos. It’s equal parts Percy Jackson + Clash of the Titans + Disney’s Hercules. The Season 1/Volume 1 DVD is now available; episodes can also be watched online or downloaded at Amazon: Season 1 and Season 2. The demigod, then & now: Steve Reeves as Hercules vs. Paul Telfer as Hercules.